In developing this new Youth Protection tool, the BSA teamed up with content expert NetSmartz, part of the National Center for Missing and Exploited Children, as well as training experts for different law enforcement agencies. Earning the Cyber Chip is a rank requirement for Scout Rank and Star Rank. Earn it by completing the Cyber Chip requirements for your grade HERE. If his Cyber Chip card is currently valid, he should simply demonstrate his knowledge to his Scoutmaster or other designated leader after joining the troop. This is not a retest. If, however, the Scout has not yet grasped these concepts, they may be reviewed (based on Cyber Chip requirements for the Scout’s current grade) to ensure understanding. All Cyber Chip cards expire annually, so if a new Scout’s Cyber Chip card for his current grade has lapsed, he simply needs to “recharge” the chip by going back to the Netsmartz Recharge area. For a youth joining Boy Scouts who was not a Cub Scout, the Cyber Chip award to be earned depends on his school grade while working on the Scout rank. If he has already completed the 5th grade, he would complete Cyber Chip requirements for grades 6-8, as would a Boy Scout joining in the 6th-8th grade. 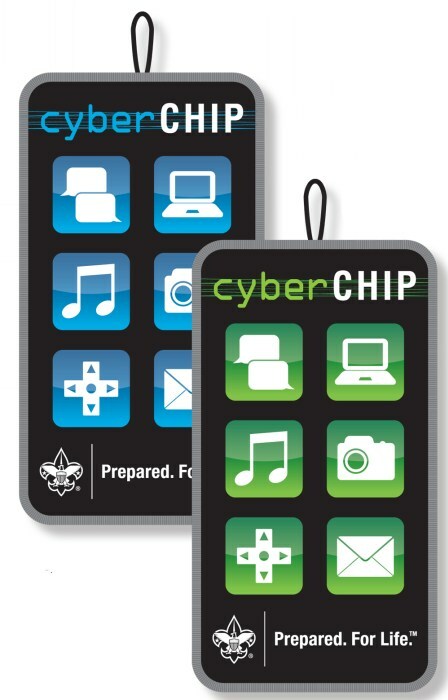 If a youth joins Boy Scouts in the 9th -12th grade, he would complete Cyber Chip requirements for grades 9-12. Since technology and youth development are always changing, the Cyber Chip requirement must be completed again by all Boy Scouts for the Star rank regardless of any prior work. Which Cyber Chip Award requirements are to completed for the Star rank likewise depends on that Scout’s current grade in school. Reference: The Mountain Echo. Mount Baker Council. April 2016. pg 9.